It is not a regular day in medical research when a dramatic reversal of disease process is discovered and proven under the most stringent scientific processes. Enter into this evaluation, operations that have been used over the past decade, and we are often left wondering why we have not thought about it earlier. The study at hand is the STAMPEDE (Surgical Therapy and Medications Potentially Eradicate Diabetes Efficiently) Trial, where medication is pitted against bariatric surgery in the control of type II diabetes mellitus in obese patients. The background of this study is that the control of type II diabetes in the moderately to severely obese is notoriously difficult, with less than 50% achieving adequate glucose control. There have been prior observation studies that show an improvement in glucose control (and consequently cardiovascular risk factors) following bariatric surgery. However, there have never been any good head-to-head studies comparing the two. In the STAMPEDE trial, patients were randomly assigned (in order to minimise bias that can lead to erroneous results) to either intensive medical therapy (IMT) or surgery. The former comprised not just medications, but diet and lifestyle counseling with scheduled monitoring and follow-up. In the surgical arm, patients are randomised to either the sleeve gastrectomy (SG) or to the roux-en-Y gastric bypass (RYGB). The key parameters of diabetic control and weight were monitored and followed-up for 12 months, with the results in the photos that follow. All the treatment modalities improved fasting blood glucose and HbA1c levels. However, the patients who had surgery (sleeve gastrectomy or gastric bypass) experienced the best results. 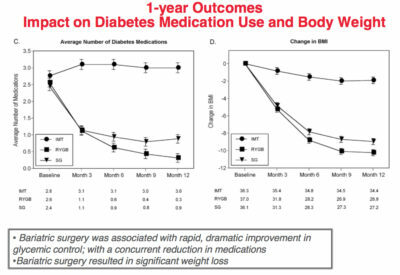 The patients who had surgery (sleeve gastrectomy or gastric bypass) saw a dramatic decrease in the need for diabetic medications. In addition, those two surgical groups also saw a significant change in the body mass index (BMI) compared to a very modest decrease in the IMT group. 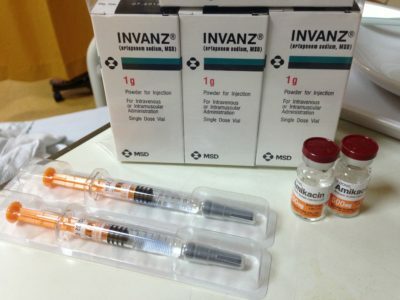 At least half of the patients in the surgical arms did not need any more diabetes medications at 1-year. The results were more pronounced in the gastric bypass arm, where 42.0% of patients actually achieved a “complete remission” of diabetes, with a normal HbA1c without the need for any medications. Not surprisingly, none of those in the IMT arm were off any medication at the end of the study. In summary, based on the STAMPEDE trial, bariatric surgery was more effective than intense medical therapy in achieving blood glucose control in obese diabetic patients, with many being able to do so without the use of any diabetic medication. Could this be considered a “cure”? While it is true that the study period of this trial is short (and longer term results are pending), given the potential complications of poorly-controlled diabetes, bariatric surgery does offer a very viable and effective treatment, in the obese. In addition, surgery now offers a real alternative (and a much better alternative, according to this study) to the daily pills and injections that living with diabetes mellitus is. Rein in the control over diabetes. To find out more on how you can further optimise your control over diabetes through bariatrics, weight-loss and metabolic surgery, contact Clinic for Digestive Surgery at +65 6570 2702 to speak to our Clinic Nurse. Alternatively, drop us an email at doctor@clinicfordigestivesurgery.com, or fill up the enquiry form at http://clinicfordigestivesurgery.com/contact and we will attend to your needs at the soonest opportunity.